Princeton grew along a Leni Lenape Indian trail that was widened in the 1700s and eventually became part of the King's Highway through New Jersey. Right from its beginning, Princeton's history has been truly American. So have its inhabitants, both great and humble. George Washington won a crucial victory here and returned when Princeton was briefly de facto capital of the fledgling United States. George Gallup pioneered modern opinion polling here. Albert Einstein and other European refugees transformed the region scientifically and intellectually. Internationally famous actors and musicians, including Paul Robeson, Bebe Neuwirth, Mary Chapin Carpenter, and Ethan Hawke, have called Princeton home. Resident writers have ranged from Sinclair Lewis to Peter Benchley. Locally beloved were small business persons such as country store owner Mary Watts and public servants like mayor and unabashed cancer battler Barbara Boggs Sigmund. And among the good and great have been a few real rogues. They are all part of Princeton's colorful saga. 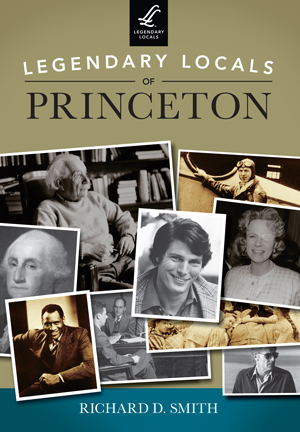 Richard D. Smith is a journalist and author who, in collaboration with the Historical Society of Princeton and with the help of numerous community members, has created a loving tribute to the personalities of a most notable American town. This is his fourth Arcadia volume.